Local student Tommy Neville has organized a concert event benefitting Youth in Arts at Magnolia Gardens at the San Rafael Elks Club on Sunday, April 6. 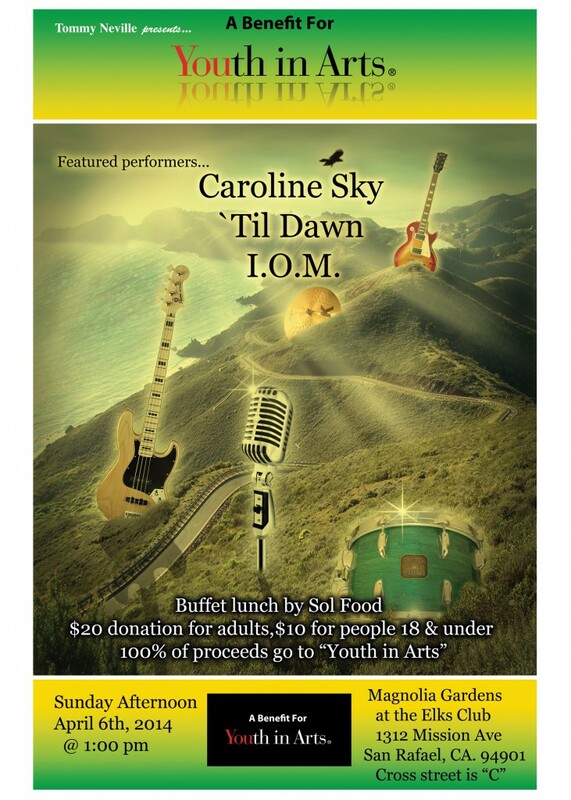 Come for lunch by Sol Food and music by talented Marin youth, including Youth in Arts `Til Dawn, singer-songwriter Caroline Sky and new alternative rock band I.O.M. with Caroline Sky, `Til Dawn and I.O.M. Sunday, April 6, 1 p.m. Youth in Arts `Til Dawn a cappella ensemble is an advanced vocal music program for motivated young artists. The group performs a mix of rock, pop, blues, jazz and soul standards and contemporary hits. `Til Dawn celebrates the value of the arts, encourages positive messages about meaningful social issues, and inspires children of all ages. Caroline Sky is a singer-songwriter who has a soulful acoustic style rooted in blues, folk, and pop. Caroline started out on Marin’s Open Mic and Festival scene two years ago, and since then, she has shared stages with some big names, including Narada Michael Walden, Jeff Watson (Night Ranger), Arnold McCuller (James Taylor) and Jose Neto (Steve Winwood). I.O.M. is a newly formed alternative rock band created by composer/ performer Tommy Neville. It’s music ranges from introspective ballads to hard driving epics. I.O.M.’s debut C.D. “Castletown” will be released on April 6th 2014. I.O.M. consists of Tommy Neville (guitar and lead vocals), Michael Albinson (acoustic and electric guitar). Alex Rusbarsky (drums and percussion), and Sanford Barnett (bass and backing vocals).